Homes and offices in Vaitele and Si’usega were affected by power outage yesterday after a container truck knocked down a power pole at Tuana’imato. 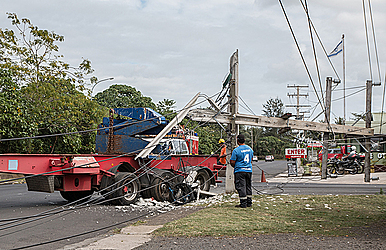 Eyewitnesses told the Samoa Observer a live wire became tangled on top of the container truck and while the truck moved away, it pulled the wire, which led to the cemented electric pole snapping. “The truck was turning but I guess the driver was not aware that the top of his truck had managed to catch one of the wires,” the eyewitness who only wanted to be identified as Sione said. Sione said a woman motorist was lucky to escape being electrocuted. “There was a lady who was driving her car and she turned in here to do her shopping seconds before the pole fell. It was good she made it on time because if she didn’t then she would have been the victim of the incident." “But luckily there was nobody there and the fire station people quickly came and told everyone not to get close to the wires that were on the ground." According to eyewitnesses, a lot of accidents occur along the Maota Samoa area and they are advising drivers and pedestrians to be vigilant when using the Tuanaimato Road. “For these big container trucks they should always be careful especially coming to such areas where it is close to the gas station and there are so many people around. Meanwhile, a resident of Siusega told the Samoa Observer electricity in their area was still out as of 7pm yesterday. Multiple phone calls to get a comment from the C.E.O. of Electricity Power Corporation, Tologata Tile Tuimalealiifano were unsuccessful as of press time.